Brand New Way to diagnose and treat diseases:. Please read our E-Book. ! There is new hope for patients waiting for a kidney transplant. Seventy-thousand Americans are on the waiting list for a kidney transplant. A third of them are parked on dialysis because their antibody levels are too high for the operation, but News On 6 anchor Jennifer Loren reports for some people that is no longer a barrier. "I used to just sit around and throw up," kidney transplant patient Soraya Kohanzadeh said. Dialysis is something Soraya Kohanzadeh would rather forget, but if telling her story saves lives it's worth it. Soraya, like many kidney failure patients, developed high levels of anti-donor antibodies through blood transfusions. Her highly sensitized immune system would likely reject any donated kidney. "Essentially, she would have a very short, sick life on dialysis," Soraya's mother Joan Lando said. But Soraya no longer needs dialysis thanks to intravenous immunoglobulin therapy or IVIG. Here's how it works, during dialysis, patients are given blood containing a mix of immunoglobulins, which turn-off the anti-donor antibodies' attack response without suppressing the patient's immune system. "A significant other of the patient comes forward, donates an organ, and there's an incompatibility there. We can treat the patient and remove those antibodies. 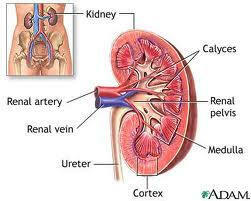 Then the transplant can be done," Dr. Stanley Jordan, Director of Nephrology at Cedars-Sinai Medical Center said. More than a year after surgery, Joan's kidney keeps her daughter alive. "It was sort of shocking to think I wasn't going to have to just be sick forever," said Kohanzadeh. This mother-daughter team works to spread the word of a little known therapy that could save thousands in need of a kidney. IVIG is covered by Medicare and can be used in both living and cadaver-donor transplants. Nearly 30% of patients on the kidney transplant list might benefit from this therapy.